A diffidence, perhaps too just, in my own qualifications will teach me to look with reverence to the examples of public virtue left by my illustrious predecessors. That all changes starting right here and right now because this moment is your moment; it belongs to you. That set the tone for his address, an angry screed of a campaign speech. I’ve been watching and listening to inaugural addresses since John F. Kennedy’s, in 1960. I’ve never heard anything like this one in terms of its divisive content and complete lack of uplift. Even its call for the blessings of the Almighty was to a nationalist God Trump seemed to be charging with protecting the country — if and only if our military and police forces failed. And absent any admission of his own fallibility, his appeal to unity sounded more like a threat of repression than a call for mutual understanding and bipartisanship. He accused “Washington” of deliberately abandoning factories and their workers, deliberately robbing Americans of their income and wantonly spending it on foreign countries, and deliberately refusing to hear the cries of an aggrieved, impoverished, and powerless citizenry. And having painted this dark picture of a horrific status quo, he proceeded to set out literally impossible goals for his own presidency. The “American carnage” of crime and gangs and drugs “stops right here and stops right now.” Really? And as for “radical Islamic terrorism”? He plainly promised that “we will eradicate [it] from the face of the Earth.” Seriously. And: “We will bring back our jobs … our borders … our wealth.” Gee, will the rest of the world cooperate to make that happen? By the time Trump got to the climax of the address, a secular doxology of the national greatness he would achieve (wealthy! strong! safe! 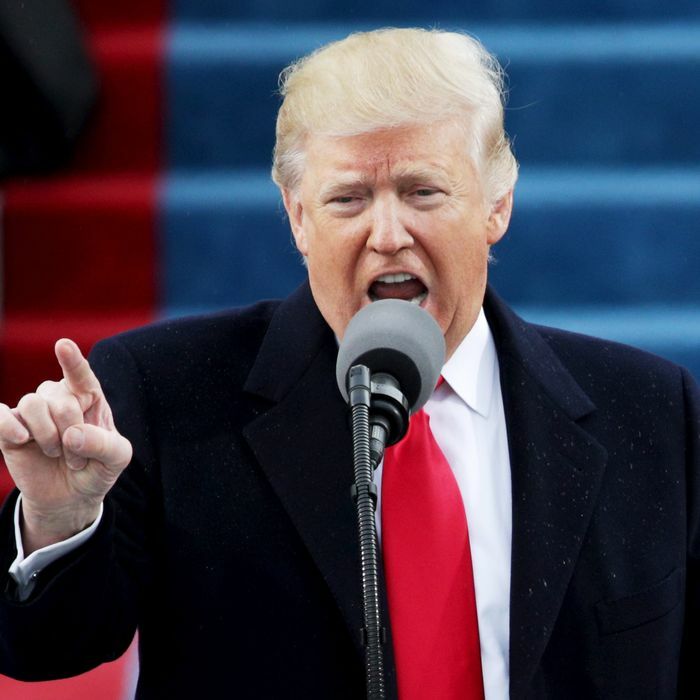 ), the hope of so many people, especially those who fear him, that the 45th president would rise to the moment and make a graceful, civic-minded speech, had long been dashed. Trump can, of course, eventually transcend this moment. But it was an ominous beginning for a presidency that was so hard to envision as normal, and that made Old Hickory look like a prophet of peace.